He was born in Cremona in 1973. He enrolled in the International School of Violin-Making in 1988, graduating in 1992. After completing his studies, under the guidance of Master Gio Batta Morassi and his son Simone, he was engaged for two years, by the "CEE workshop", a project implemented with community funds to assist the young school graduates on their professional path. In 1995 he worked for a short period of time, perfecting his skills in the workshop of Master Asinari. Over the years he participated in various national competitions, such as Baveno, and in various international competitions such as Wieniawski in Poznam, Poland, as well as in the Cremona Triennial Competition. 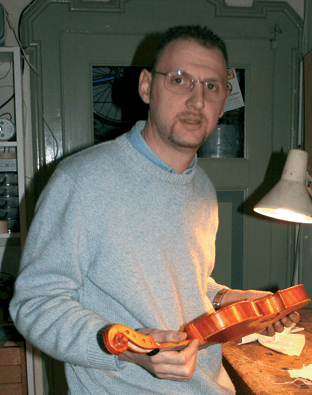 He builds violins, violas and cellos according to the classical Cremonese models (Amati, Stradivarius, Guarneri), under the guidance and counsel of Masters Gio Batta and Simeone Morassi. He has set up his own workshop in Cremona. Since 2001 he has been teaching practical violin-making workshop at the International School of Violin-Making in Cremona.